-Curate’s rumored expansion: The ever-popular Curate restaurant on Biltmore Avenue in downtown Asheville is rumored to be expanding into space next door that is currently occupied by a yogurt shop. The restaurant, which specializes in Spanish tapas, is helmed by Asheville’s own celebrity chef, Katie Button, and it has already expanded its reach by opening Nightbell Restaurant and Lounge on South Lexington Avenue about a year ago. -Smoky Park Supper Club opening: Smoky Park Supper Club, the long-awaited restaurant built from shipping containers on Riverside Drive, is planning an official opening on Sept. 9. -Buxton Hall Barbecue restaurant opening: Word on the street is that another long-awaited restaurant, Buxton Hall Barbecue on the South Slope, is planning a private soft-opening event next week. No word yet on an official opening date. -Other Asheville restaurants coming along: Other restaurants to keep an eye on include the brick-and-mortar version of Gypsy Queen Cuisine (Asheville’s first food truck) on Patton Avenue west of the Bowen Bridge and Red Ginger dim sum restaurant on Patton Avenue in downtown Asheville’s Capital Center building. -A new Ingles store at 863 Brevard Road, across from Asheville Outlets. The plan is to tear down the current store and build a new 72,238-square-foot store w/ gas station. -Givens Gerber Park: The initial Givens Gerber Park Plan was to build 240 multi-family units, and phase one under construction right now. They want to add 22 units to that. -Mission Hospital is planning to build a three-story building just under 50,000 square feet, w/basement, on Long Shoals Road, for a new Mission My Care Plus. -An additional 104 residential units over 4 new buildings is proposal for Ascot Point Apartments in Asheville. -Fiesta Latina in Asheville: Fiesta Latina is set for Oc. 10 in #Asheville at Pack Square Park. -Snarky video commentary on N.C. ALE enforcement action in the Asheville area: A guy named Mitch Earl has posted a snarky video commentary on all the recent N.C. ALE enforcement action in Asheville. The video makes use of Hitler and Nazi references, so be warned – this is pushing the envelope. Haywood Comics is coming to 600 Haywood Road, next door to Firestorm bookshop and cafe. Work is set to begin to turn a former Ingles at the corner of Haywood Road and Patton Ave into an Ace Hardware. Altamont Brewing on Haywood Road is moving ahead with expansion into former Nona Mia next door. Work is underway for new Frostbite ice cream shop on Patton, in front of Sky Lanes bowling alley. Krispy Kreme doughnut shop on Patton Avenue is getting remodeled inside and out. Shop hasn’t changed in years. -Masterminds on hold: I missed posting this when it first hit about a week ago, but the Zach Galifianakis/Kristen Wiig/Owen Wilson/Jason Sudekis movie Masterminds, which was shot around Asheville last summer, has been put on hold. Variety reports that the movie studio that financed the movie put Masterminds on hold indefinitely is struggling through bankruptcy proceedings. REQUIREMENT: The United States Government intends to award a succeeding lease using other than full and open competition for an existing lease that is expiring in Asheville, NC. The Government will consider relocation if economic and other factors determine an alternative space to be advantageous to the Government. Consideration factors include all tenant improvement costs, moving costs, telecommunications relocation costs, and agency special requirements. REQUIRED: The Government requires a total of 33,932 usable square feet of space. All services, supplies, utilities, partitioning and tenant alterations are to be provided as part of the rental consideration. TERM: The lease term will be 15 years, 10 years firm. Occupancy is desired no later than October 1, 2015. -Political movers and shakers: Buncombe County Commissioner Holly Jones has announced that she’s running for statewide office in seeking to be elected lieutenant governor. Meantime, Asheville City Councilman Cecil Bothwell announced that he would run for a seat on the Buncombe County Board of Commissioners. A ride with Dark Ride Tours is like visiting a spooky theme park attraction, hearing scary ghost stories, participating in a ghost tour, and being in a haunted house all at the same time. It’s a haunted house on wheels! Participants can choose to book one of two hour-long ghost tours online, either the Haunted Graveyard Tour in which they will visit historic Riverside Cemetery, or the Spirits on the River Tour and visit several haunted places along the French Broad River. In addition to hearing chilling tales of these frightening sites, Dark Riders will experience for themselves why we say our hearse is haunted. Customers shopping at many of Asheville’s wonderfully diverse shops or imbibing at various bars and breweries in the Asheville area will also be able to catch a shorter but equally spine-tingling ride when the hearse spontaneously pulls up to offer them an impromptu tour at a discounted price. Followers of Dark Ride Tours on Twitter can even tweet a request for the haunted hearse to come and pick up their party for a ride! On September 1 at the Lexington Avenue Brewery, Dark Ride Tours will host a ribbon-cutting ceremony where guests will be able to sit in the haunted hearse and get a taste of the ghostly experience. Those who book a tour online will catch the hearse at the LAB at 39 N. Lexington Avenue in downtown Asheville. The website at www.darkridetours.com provides complete information on what to expect on a Dark Ride tour. Buncombe County Health and Human Services wants parents in Buncombe County to know that there are new immunization requirements for school aged children in North Carolina. To help keep kids safe, the State of North Carolina made the changes to better align the NC requirements with the current National Advisory Committee on Immunization Practices (ACIP) recommendations. The changes were effective July 1, 2015 and apply to children in childcare settings, children going into kindergarten, and children going into the 7th grade. Does your child have a shield of protection against dangerous and contagious diseases? “Due to the communal nature of school settings and the tendency of kids to share food and drink, they can easily spread illnesses that can make them very sick, keep them out of school or worse” says Buncombe County Medical Director, Dr. Jennifer Mullendore. She adds, “When your child is up to date on their vaccinations, you are protecting them against many serious diseases. As a parent, that’s one less thing for you to worry about.” One of these illnesses, meningococcal meningitis, can cause the lining of the brain and spinal cord to swell and can kill an otherwise healthy person within one day after the first symptoms appear. Pertussis (Whooping Cough) is another illness that is very contagious and serious, especially for infants and for those who are not immunized. There were 60 reported cases of pertussis in Buncombe County in 2014. Schedule your child’s immunizations today! Please talk to your healthcare professional or call the BCHHS Immunization Clinic at (828) 250-5096 for more information. The BCHHS Immunization Clinic is located at 53 S. French Broad Avenue. No appointment is required. They accept most health insurance and participate in the Vaccines for Children program which provide free immunizations to children who qualify. The immunization clinic or your doctor can also provide you with a copy of your immunization record. We encourage everyone in our community to join the shield of protection. Get Immunized! Details of the new immunization requirements can be found on the North Carolina Immunization Program website at: www.immunize.nc.gov or on our website at www.buncombecounty.org/immunize. Hurray for Curate expansion. We were among the first month’s customers when it opened, and went there many times until the weekend crowd got so big that reservations were hard to get. As to the US Govt lease you were seeking details on…I can’t be specific, as I am not certain which federal specific office/agency this might concern. That said, the notice of intent is characterized as “Using Other than Full and Open Competition”. This indicates that the GSA intends to renew an existing lease for an agency rather than to seek requests for proposals on new space (barring compelling economic factors for relocation, which is in general highly unlikely). So I can’t tell you which specific agency this is, since I don’t know offhand which agencies are present in the geography delineated in the description, but as it is effectively public notice of an intended lease renewal, there is not big news here. Anyone wanting to know which agency is involved should be able to narrow it down fairly readily, as the square footage would indicate it is a pretty big office for any federal agency in AVL. My first guess would be a renewal of the local SSA office, but they seem to lie slightly outside the area described…which oddly enough would include Montford and areas to the north of Montford. Will Cecil Bothwell resign from City Council to run for County Commission? Would he be allowed to serve on both? I don’t know if he’d have to resign one to run for the other, but I know he can’t serve on both. My mother always told me: if your kream is krispy, it’s time to throw it out. Apparently, the corner lot on Southside and Short Coxe was recently sold. “Developer plans to construct 20 townhomes with garages” per Whitney CRE’s e-mail blast. 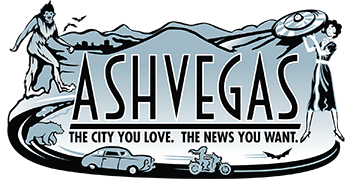 What’s being built on Smoky Park Highway next to the Waffle House, near I-40? And what’s the status of the Ingles that’s supposed to be built next to Ingles on Smoky Park, to replace the older store in the same area? And what’s the deal with those creepy new ginormous photographs on the front of the Waffle House? Weirds me out almost as much as the name “Krispy” “Kreme”. The Brevard Road Ingles is 53,000 square feet and only 20 years old. Does it really make sense for them to tear it down already, for 20,000 extra square feet? Couldn’t they just build an addition? I’m sure they never thought of that. There’s already a relatively new MyCare Plus on Long Shoals – not sure why they need ańother one. More Curate can only be a good thing. I’ll take all of that ya got.